As I mentioned on facebook, Marty managed to find us a race to do while we're down in Florida this weekend. This is one of his favorite pastimes - whenever we travel somewhere (when it's not race related) he likes to find us a race in the area. 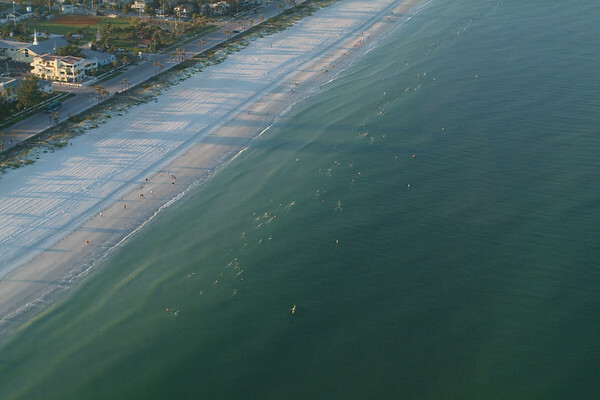 Tomorrow morning in St. Pete they are running the Hurricane Man Swim - a 2.4 mile and 1,000 yard swim race along the beach. I watched Marty do this back in 2001, where he swam some ridiculously fast time and won the master's division (anyone over the age of 18 in swimming). We still have the embroidered towel that says "Hurricane Man" to prove it. This actually works out well since I still haven't been able to run yet. Stupid foot. I decided to just go ahead and sign up for the 2.4 mile version since this will be my only workout of the day. Also, I remember from when I watched all those years ago, the 1,000 yard race was mostly kids from the swim team - and getting trounced by a bunch of 10 year olds doesn't seem all that fun. I remember there were a lot more adults in the 2.4 mile race. And although most were fast, some were not so I won't be last. I have never actually swum this far continuously before so I plan on putting it in cruise control and won't think about any creatures that could be swimming with me (the race gets pretty spread out and they do it in 3 waves). Here's an aerial pic of one of the waves from a couple of years ago. Congrats to you for your accomplishment, and honor. Congrats to your husband for his.